Tonight me, Sam, and at least half my facebook friends are all going to see Metallica, LOG, and um.. oh yeah Gojira! Also, I ended up not going to Richmond for training. They sent my trainees to me instead! I was kind of sad though, I haven't seen Mikey & Janine in a few months. 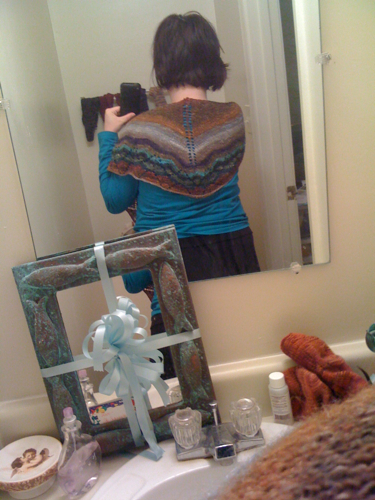 I have finished my shawl. I kept hoping for a sunny day for a nice photoshoot but stupid clouds just keep hanging around. So, this is as good as it'll get for now. 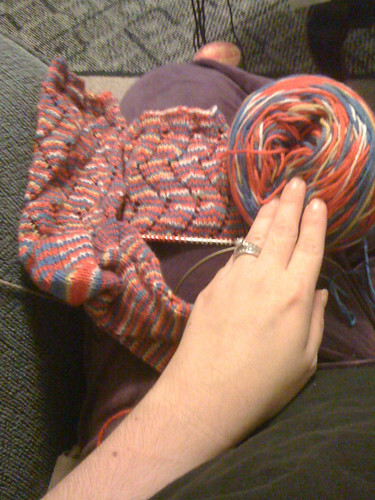 I also have finished a sock and a half from my first shipment of the Retro Video Game sock club. I'm amazed at how much yarn is still left. I think I can get 2 pairs out of this skein! I'm also excited because next weekend is SAFF! YAY!